Vermont Sen. Bernie Sanders wants you to know that the race for the Democratic presidential nomination isn't over yet. On Wednesday, Sanders faced former Secretary of State Hillary Clinton in yet another primetime debate, covering everything from immigration to climate change. Although he has fallen behind Clinton in the Democratic delegate count, Sanders' closing statement at Tuesday's debate sent a strong message that he's still very much invested in the race ahead. Sanders had seemed to be losing momentum with voters as he lost several states to Clinton on Super Tuesday last week. He has also consistently lagged far behind Clinton in terms of superdelegate support throughout his campaign. On Tuesday, though, Sanders regained some of his momentum when he narrowly beat Clinton in Michigan's Democratic primary, picking up 65 delegates for his win. On Wednesday, he took the stage with plenty of energy — and proof that he could still beat Clinton in a head-to-head matchup. Throughout the night, he hit Clinton hard, as he usually does, on her alleged connections to Wall Street and her track record. In his closing statement, Sanders focused less on Clinton and more on his case to the American people. This has been a wonderful debate, but time being limited, some of the most important issues facing our country have not been asked. Among those important issues, according to Sanders, was wealth inequality, a key part of Sanders' campaign platform. (Let's be honest, it's really the key part.) Sanders asked if it was acceptable that a minority of Americans controlled the majority of our country's wealth. He also asked if it was acceptable that Wall Street and billionaires are spending millions of dollars "to buy elections." 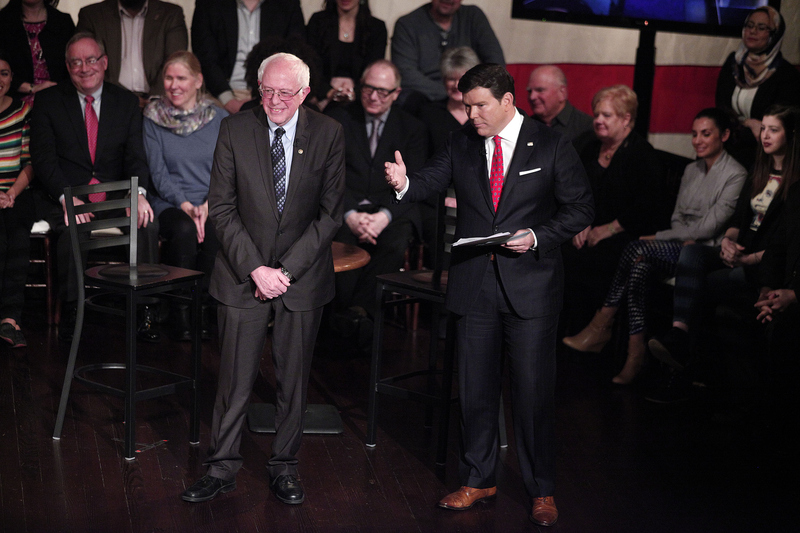 Sanders rounded out his closing statement with a similar question about the cost of college tuition, an issue that was heavily debated on stage throughout the night. And that is, is it acceptable that in America the top 0.1 percent now owns almost as much wealth as the bottom 90 percent. Is it acceptable that while the average American works longer hours for lower wages, 58 percent of all new income is going to the top 1 percent. Is it acceptable that Wall Street and billionaires are spending hundreds of millions of dollars trying to buy elections? Is that democracy or this that oligarchy? Which is why I believe we've got to overturn Citizens United and move to public funding of elections. Is it right that in the greatest, wealthiest country in the history of the world, so many of our young people can't even afford to go to college or leave school deeply in debt, in the wealthiest country in the history of the world? If we stand up, fight back, we can do a lot better. That's why I'm running for president. With his closing statement, Sanders not only called for more conversation on the issues that matter to him (ahem, the country). He also called for some specific actions, such as the overturn of the Citizens United decision. All in all, he didn't say much that viewers probably hadn't heard before, as Citizens United and free college tuition have been as much a part of his campaign as taking down Clinton's connection to Wall Street. It will be interesting, come the next primaries, to see if Sanders' momentum can last beyond Tuesday's victory in Michigan and Wednesday's debate in Florida.